Status: Legally recorded as byway open to all traffic (Oct 2018). Oakridge Lane in the Parish of Aldenham (shown right, in red) runs from Watling Street (Point F) to the River Colne (point E), along the river bed, then out (point D), across the private drive (point C) and on to a junction with BW 72 (point A). Here it becomes a hardened surface track that continues south westwards to the water treatment works. 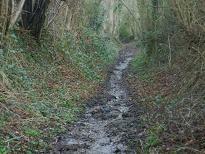 Oakridge Lane is known as a 'UCR'. This stands for unsurfaced county road. It means that the County Council is responsible for maintaining its surface and keeping it clear, and it is legally a road (so you can ride horses on it). The un-made-up section has county road numbers 4U23/30 (from A to C) and 4U23/40 (from C to F). 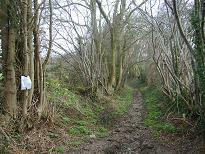 Although a road, its maintenance is handled by the County Council's rights of way team (according to the County Council's website). The contact is Dawn Grocock. 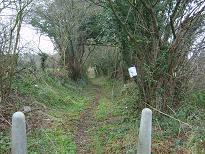 Bridleway 72 has been diverted slightly at Point B, which is not shown on the sketch map. Following the application in 2006 to record the route on the definitive map, the porcess was finally concluded in October 2018 when the order recording the route was confirmed. 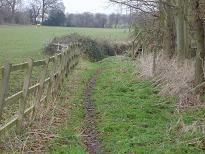 Photographs (taken 27 Jan 07): The following photographs illustrate the route, starting from the junction of Oakridge Lane and Aldenham 72 bridleway, near Hill Farm. Photograph (taken 27 Jan 07): The entrance to the river at Point C.
Photographs (taken 27 Jan 07): Starting at Watling Street (Point F) and part way along from F to E.
20 Dec 06: Application made to have this path recorded. 9 Oct 09: Order made to record the route. 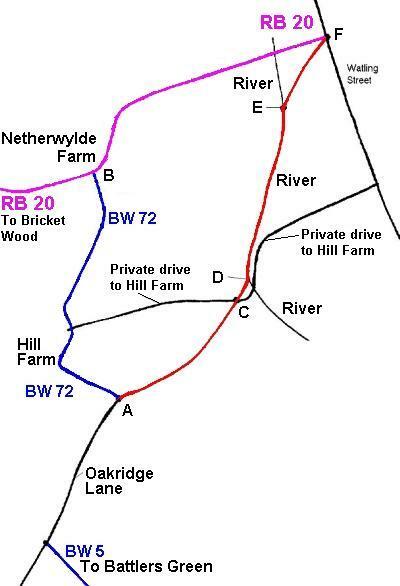 The Hertfordshire County Council (Aldenham 83) Modification Order 2009 will, if confirmed, add this route to the definitive map as part restricted byway, part byway open to all traffic. 1 Jan 10: At the close of the objection period, there were two objections. 9 Oct 12: The order was confirmed, but on 28 Oct 13 it was quashed by the High Court and sent back for re-determination. 13/14 Aug 14: The second public inquiry was held. 6 Dec 16: Order confirmed with the modifications we asked for on width and alignment. 12 Jul 17: High Court hears challenge to the order's confirmation. Part of the order was quashed and has to be redetermined. 4 Apr 18: Third public inquiry held - this time only into the quashed part of the order. Oakridge Lane commences as a Byway Open to All Traffic from Watling Street at TL 1574 0149 and a junction with RB 20 then continues generally south west for approximately 170 metres to TL 1565 0134 where it enters The Brook. 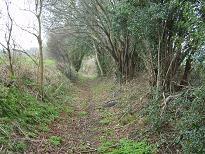 It then follows The Brook and its eastern bank south west for approximately 325 metres to TL 1557 0103. From here it continues running generally south west to a junction with FP 26 at TL 1555 0097 leaving The Brook at TL 1555 0096 and continuing to a junction with the drive to Hill farm and Footpath 9 at TL 1554 0092. It then continues as a Byway Open to All Traffic across the drive to Hill Farm running south west for approximately 355 metres to a junction with FP27 and Oakridge Lane (county road) at TL 1529 0071. Width: Varying between 4 and 14 metres from TL 1574 0149 to TL 1529 0071, as shown uncoloured [or blue] on the Inland Revenue Valuation Plan prepared under the Finance (1909-1910) Act 1910. Appears on definitive map sheet: 77. The words in red were quashed by the High Court in 2017, and this is our interpretation of the inspector's redetermination letter. This will be updated when the Council circulates the order as confirmed, showing the exact wording. © 2018 Patchetts Green Bridleways Trust. File Reference: EC202.